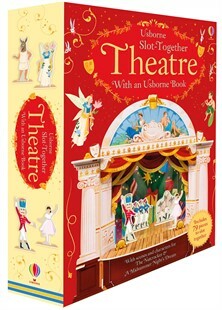 Press out the pieces and slot them together to create a stunning model theatre. Includes scenery and characters for performances of The Nutcracker and Shakespeare’s A Midsummer Night’s Dream, and a QR link to download specially recorded music. There’s also a book with instructions for building the theatre, and stage directions for the shows. Perfect for budding thespians and dancers to put on some great entertainment for the family. A brilliant and beautifully constructed kit to build your own theatre and put on plays. My 9 year old daughter has loved playing with this and presenting shows! When can we have additional story packs so she can present more plays? Our 7 year-old girl is fascinated by this. It has given hours of fun. She ploughs through the book reading the lines and following the stage-directions using the App and its musical links. The theatre is easy to put together and surprising sturdy. Beautiful to look at. A lovely product: well thought-out and thoroughly engaging. I suppose it helps that she does ballet and has seen the nutcracker, but this is an excellent present! Very 'girly' but great fun. Congrats on a great product. My 9 year old daughter received this for Christmas and absolutely loves it! It has been transported to various family members' houses so that she can perform for them. The link to the music is a great addition. She allows her 5 yr old brother to help - by way of scene changes - and he really enjoys this. A really great toy which develops a range of skills. It would be lovely to see 'add-on' packages available to buy which provide the scenery and characters for further plays.